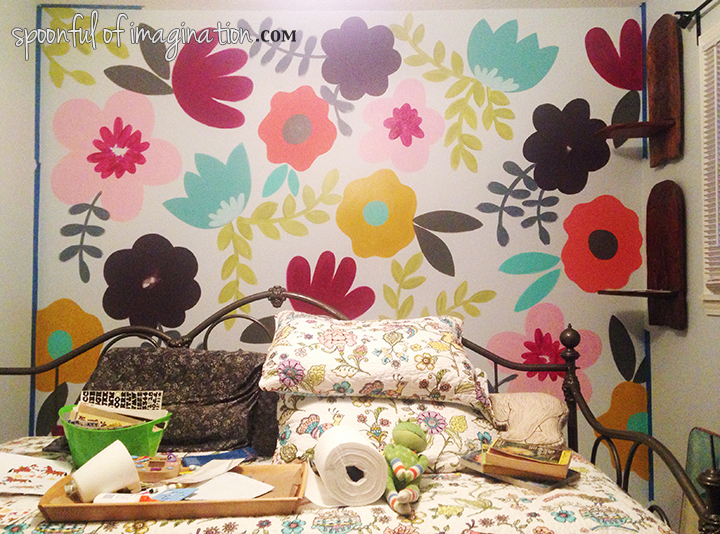 Have you shopped for wallpaper recently? I have, and it can be expensive! 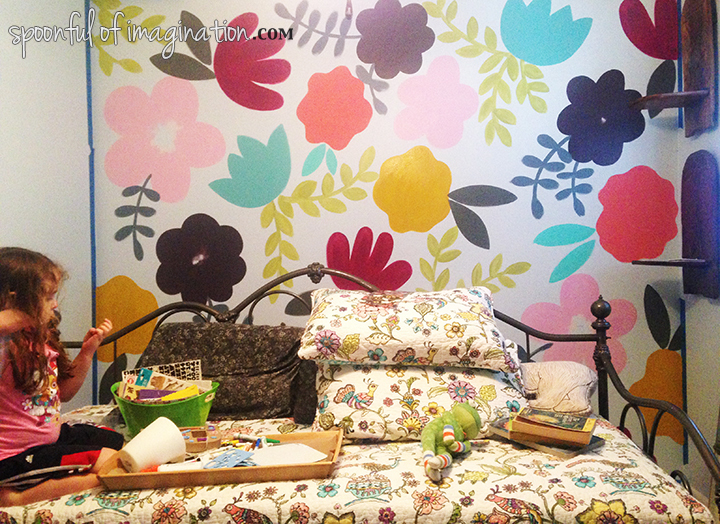 I shopped a variety of stores and even looked into the removable wallpaper, and I just couldn’t stomach the price. 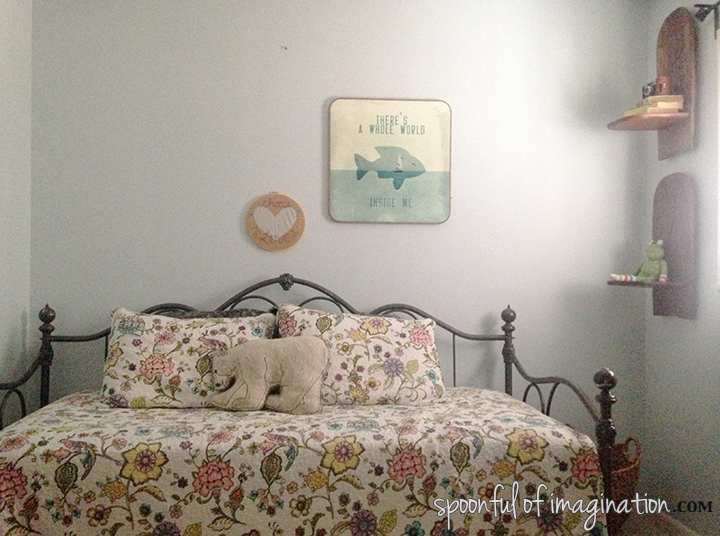 We have this room that has acted as our foster bedroom and guest room. It’s kind of an awkward sized room. Based on the door’s entrance, closet, and one small window the bed has had to be against this wall to allow for the most free floor space as possible. The small window does not let in a lot of natural light, so I painted this room a very, very faint blue to try and brighten up the space as much as possible. You can see the before wall color and other half of the room here. I have loved the wall color, but there is a lot of it. I’m also realizing not one room in my house has all four walls the same. Accent walls are currently my jam. Off and on I have thought of wall papering that back wall to break up some of the blue. After researching a few papers, I realized the ones I loved would cost me around $300. With a list of other projects I want to do in the house, I couldn’t justify spending that amount on a room that is pretty finished compared to other spaces that need more TLC. 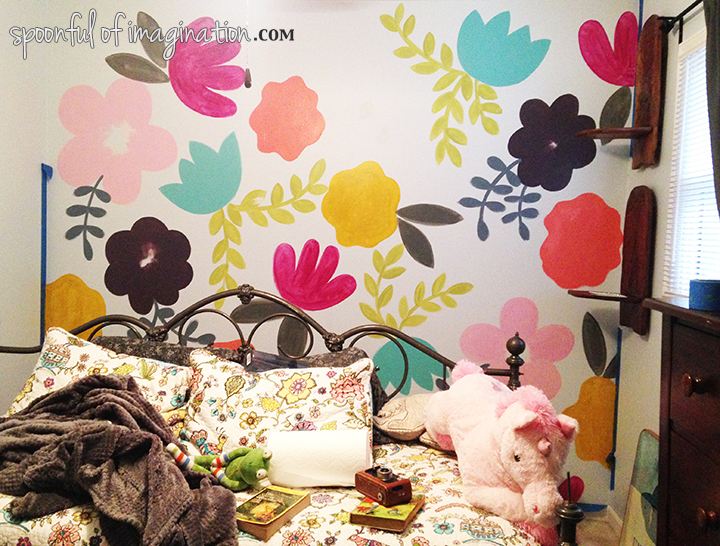 After ruling out wallpaper, I considered stenciling the wall since I did my daughter’s and boys’ bedrooms and love them. 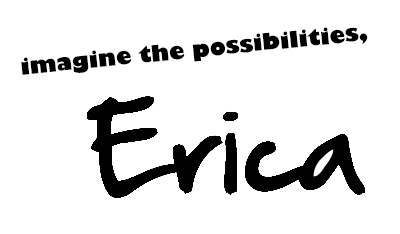 There was a part of me that wanted something different from a stencil though. 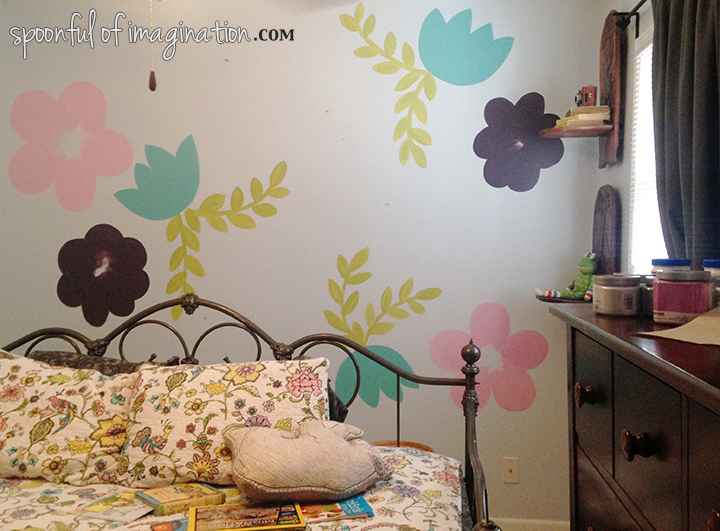 About five years ago, I painted a floral wall for my daughter’s nursery. I loved it, but it took forever. I was hesitant to do that again, but then I realized its been awhile. I have learned a few things, and why not try it again. It’s just paint! If I didn’t like it, I could always sand and paint over it. I went for it. The first step was to pick out my colors. 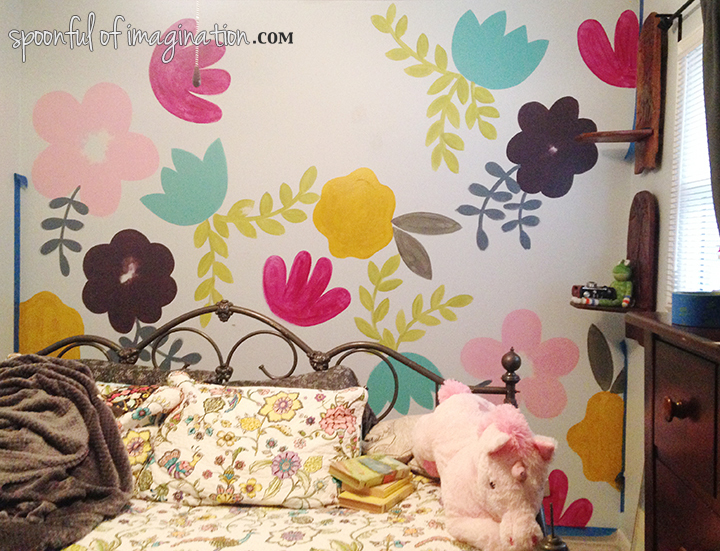 One reason I think my first floral wall took so long was I used cheap paint. I decided I needed to use nicer than the the least expensive acrylic paint bottles at the craft store. I ended up opting for paint samples mostly of the HGTV paint line at Lowes, and they were perfect. I used the same wrapping paper as my inspiration that I used on my last sign. Simple, sweet flower shapes would be my base and I would embellish them a little more towards the end of the project. My second step was to figure out placement of color and different shapes. I picked two flowers to start with placement/color and grew one new color and flower/leaf at a time. 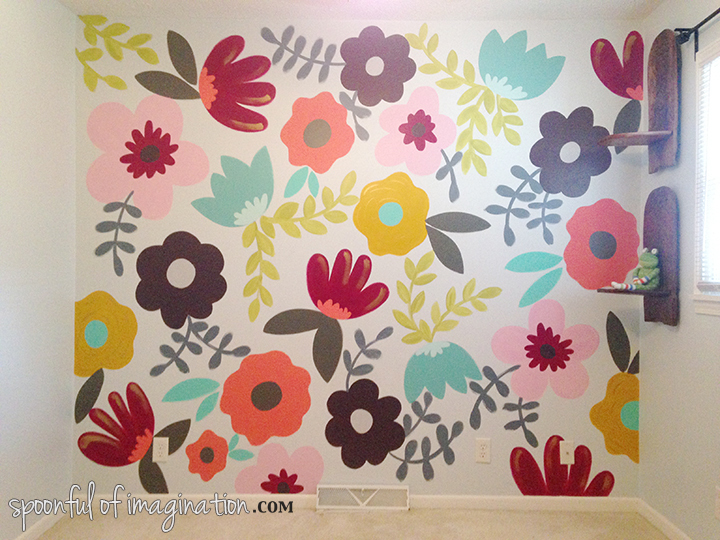 Whenever I did that new flower, I tried to do a few of them at the same time…just spread out across the wall. Each flower needed two coats. The only one that needed more was my fushia flower. The color has some red in it…which is always a hard color to paint. Red will always needs lots of coats. After each flower was covered in coats, I started adding more detailed layers to the flowers. I ended up leaving the limey green leaves in one coat. I liked the painted look it created. 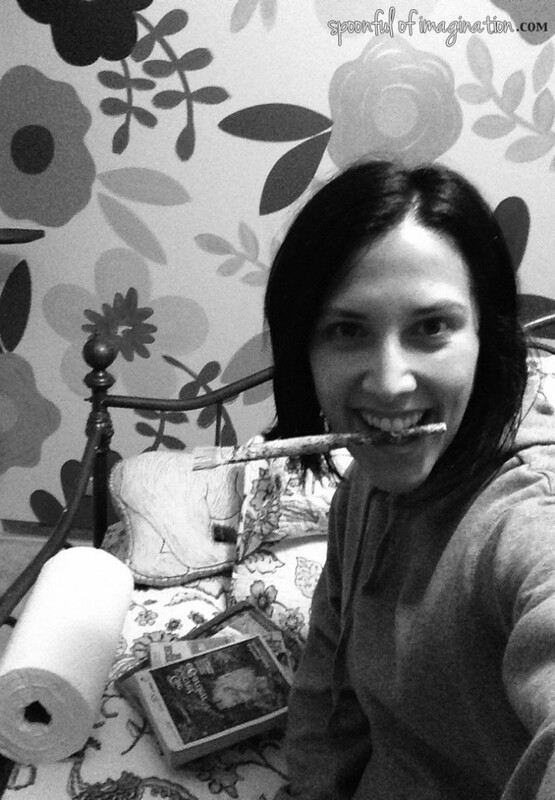 These pictures aren’t the best but are what I sent to my sisters and a few friends as I painted. 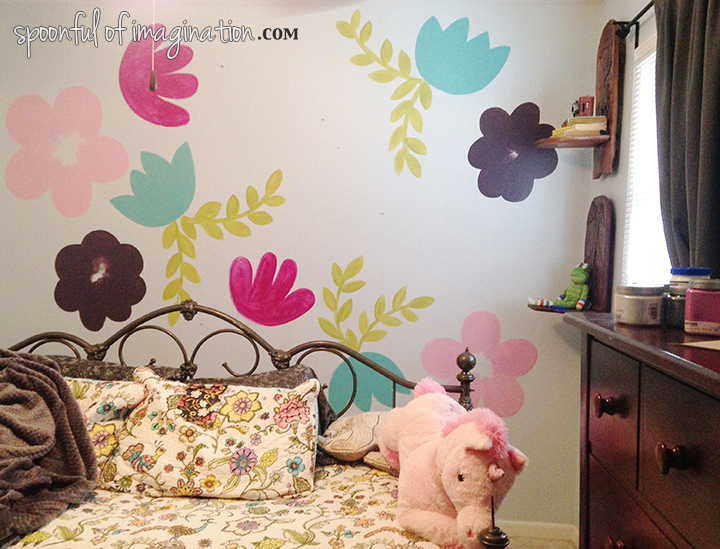 I was obsessed and excited as the floral wall took shape. It was addicting and really only took a few days working off and on! I made a decision to enjoy it and not let it stress me out. I painted each flower like I would on a sign. I didn’t worry about the edges being “perfect”, but left them to have a slight brushed look. The simple imperfection and not correctly centered flower centers make all the little artsy elements come together to create a really fun/funky yet pretty look that I love. I really love how it came out! The flowers are simple yet beauitful. 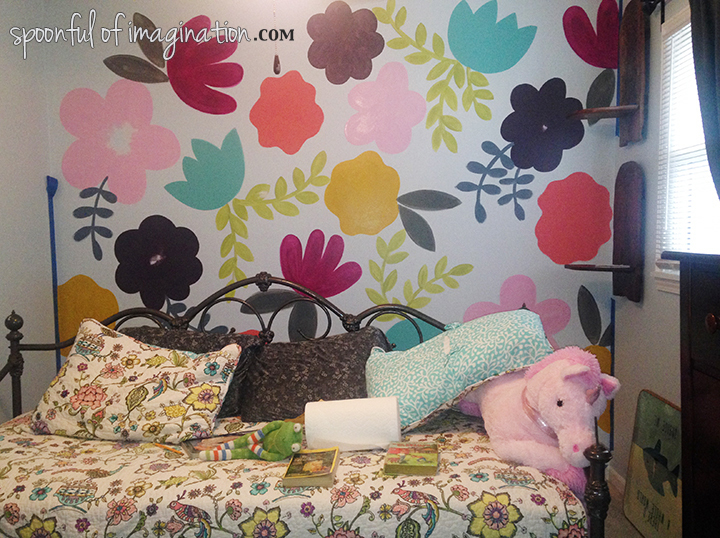 The pops of colors play together well and create a really warm, fun feel. 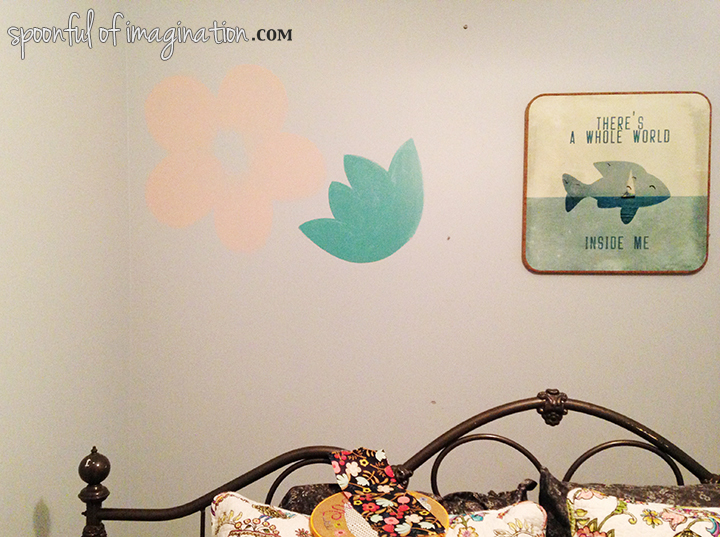 That light blue wall was the perfect base to embellish on. 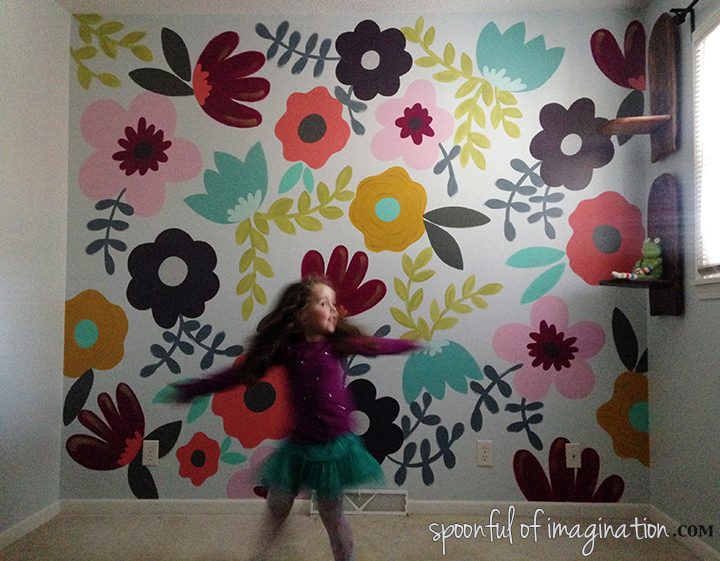 This floral wall allowed that room to be a little more fun, yet it didn’t add a huge amount of color that would make a small, poorly lit room feel even smaller or dark. What do you think? 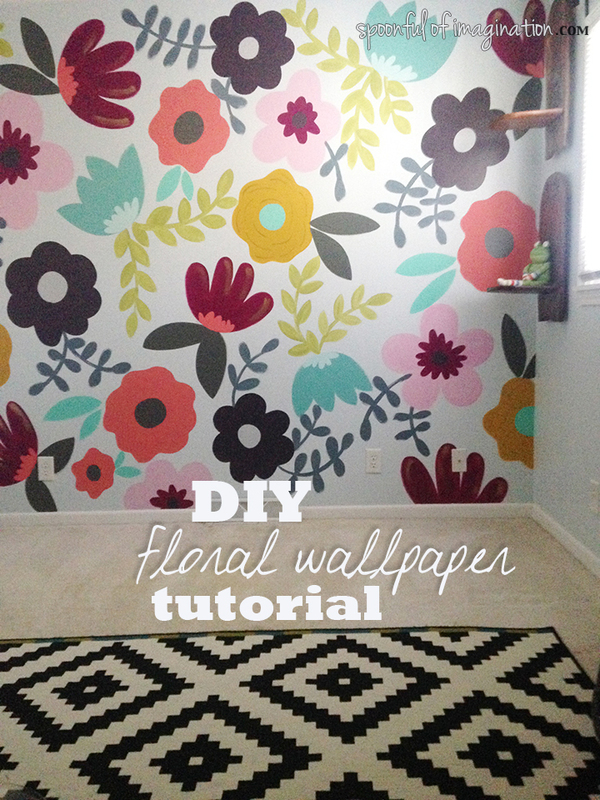 Would you try to paint your own “wallpaper”? The thing with this design is I can just paint over it when we tire of it. For now, we love hanging out in this room. I also can’t stop painting these flowers. I made another sign that includes the flowers and I just love it! What do you think? 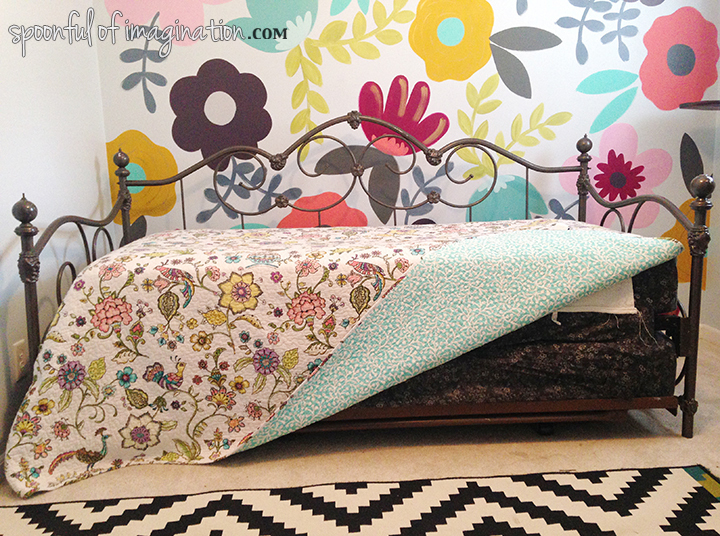 Does this simple design yet pop of color pull at your eyes and heart too? This hymn just adds a sweet touch for a powerful reminder to hang in your home. If you are interest in this sign, you can see it in my shop! Wow! It looks beautiful. Great job, friend! You are one talented girl!!! Love it!!! 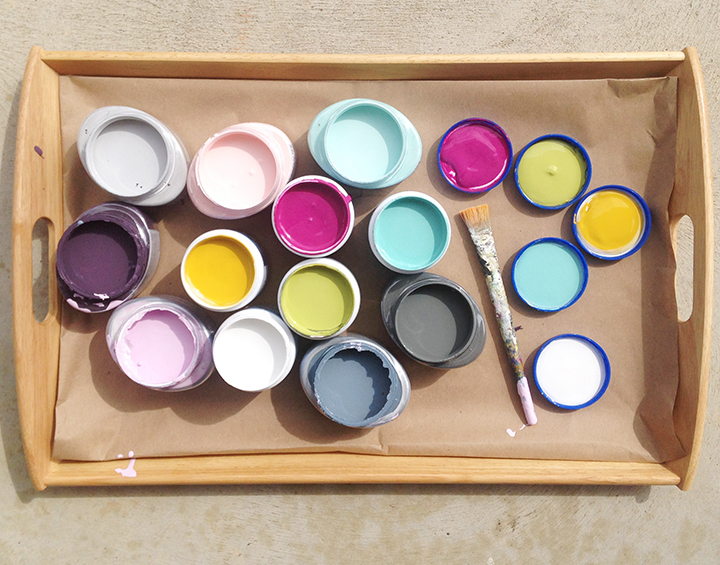 Beautiful ….saw this when I was trying to find how to paint a checker board game table on a old round table I had found…want to put it on porch for grandkids to play with when they come….enjoyed looking at your page…I am an artist and I got a few ideas .you are very creative. 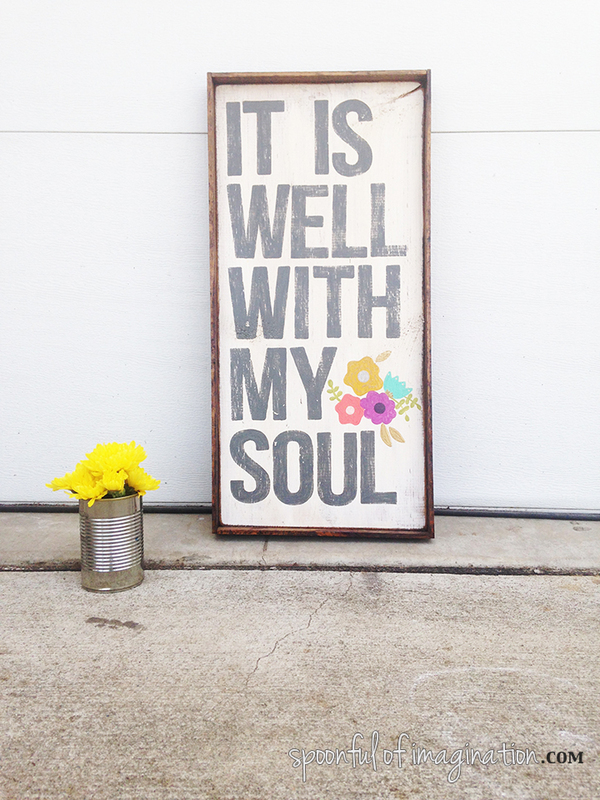 It Is Well With My Soul is not in your shop on eBay. I don’t have a shop on ebay. I’m so sorry. There must be some confusion. 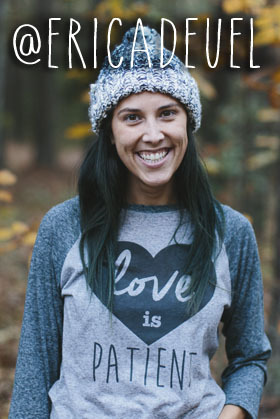 My shop is right here on my site. You can get to it at a tab at the top, but that sign is sold out. I’m sorry!